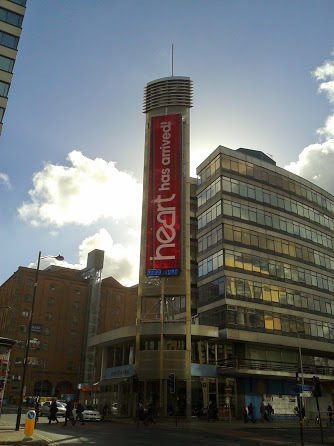 There has been a lot of discussion about the migration of “Real Radio” to “Heart” on places such as the Media UK discussions and on other places such as Digital Spy. What caught my eye, or ear perhaps, was the the interesting situation over on what we used to know as the “Marcher Group” stations. I’ll have to admit to having a bit of a soft spot for the old “ten thirty four” and associated stations. For it was as a young lad, when Key 103 was in it’s early pretentious “Music not Music” era I stumbled upon “Marcher Sound” that soon morphed into “MFM” which was one of my founding influences in the “radio scene” and on and off I’ve listened since. Now the interesting situation here is that the ex Marcher stations, which did carry the “Heart” Brand are turning into Capital, while the relatively new “Real Radio North Wales” frequencies are going to change to Heart, including the same “local” bit that were on Marcher stations. I thought I’d set the modern day equivalent of pressing “play and record” and pull a recording of the 103.4FM tx “from the cloud” and see just how “Heart” (I must try hard not to call it MFM) cope with promoting the changes, both that “Capital is coming” and that “Heart” will be “somewhere else” with the same product. Overall I’ll have to say that a pretty good job was done based on my sampling of Wednesday 30th April. Here’s the 103.4 Audio from 30th April 2014, it’s the Breakfast Show hosted by Spence McDonald and Fiona Sadler, all times are approximate. I’m guessing that there was a lot of thought gone into how to describe the changes, what comes through on all the links I listened to was the use of the term “preset” rather “frequency”, which I guess makes some sense. I’ve love to know how the process behind coming up with the concept of using the term “preset” came about. Given the regular use I’d guess this is a deliberate decision, over use of the term “frequency”. A very nice produced promo, after the break each time when there was a “Capital” promo the next piece of music was a “capital” feeling song. Was this a deliberate move? Kudos on the schedulers if it was. I noted the “Do I have to move” comment. Many listeners to this would have be tuned to the Wirral 97.1 service, now Spence was correct in stating the “Heart North Wales” over spill. However the former “Real Radio” 105.4 would be an equally, if not better, an option for the Wirral based listener to hear a “Heart” branded service. Now of course this may have different advertisers (would Heart North Wales be targeting Wirral listeners?) and of course a different breakfast show not featuring the hosts in question. Of more complex nature is that fact that the “New Heart” North Wales “local” advertisers will be giving Communicorp money, while “local” advertisers on “105.4” will be giving Global money, while at the same time it is on “Global’s” airwaves that listeners are not being told about the ability to listen to the North West Regional, but are told to tune to the “other companies” North Wales frequencies. That’s before you get to the point of 105.4 being a rock solid signal down a large proportion of the North Wales Coast. Another solid promo right on the “Capital Brand”. Various comments “will be here where I am speaking though your speaker” and “you’ll need a new pre set” try hard to explain the change. It’s made me think how much a “frequency” means, but that’s a whole other blog post. A nice comment about “buying a house” I thought was a good touch in relating the link to the audience, and the “if you have a dial” reinforces the “frequency” question. Short and too the point, again using the “preset” terminology – the term “preset” must be a concious decision over which term to use! As a final related note to the promos heard here, based on what I listened to over on the “Producers Prodcast”, the Production Team at Leicester Square were probably responsible for the “Capital is Coming” promos you’ve listened to here, so check out Ryan Drean’s interview with them here.